Anita Majumdar as Cindy (centre) goes to great lengths for Eva Barrie as Crystal (right) to finish her business in Mules. Tim Walker as Troy (left) learns the hard way that it’s sometimes just best to look the other way. 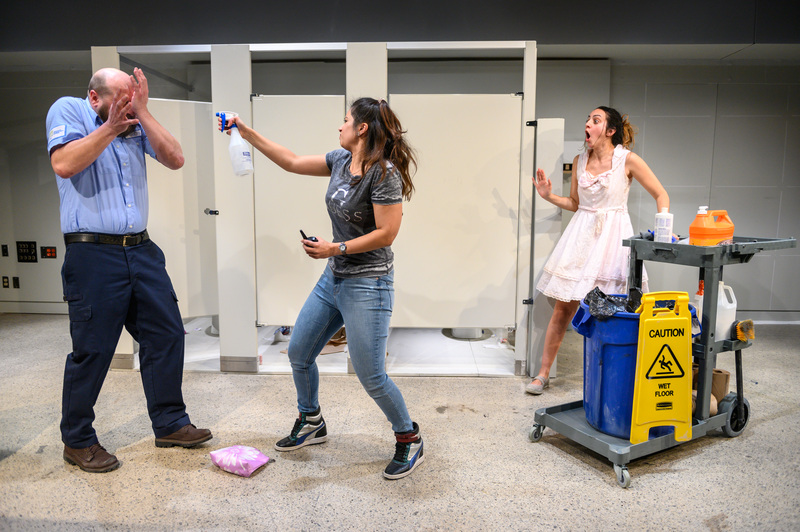 Theatrefront’s renegade comedy cut with suspense and tragedy conceals the harrowing magnitude of gal pals looking out for one another. Truth be told, it wasn’t until the 5th time that TorontoStage.com writing staff passed through customs and were flagged for full body cavity searches that a decision was made to call it a day. Yes, a call to friends in high places on our payroll would continue to provide a timely release as it has so many times before but there’s nothing wrong with quitting while you’re ahead. The deal is definitely going down prudently in Beth Graham and Daniela Vlaskalic’s Mules where laughter and irony is arresting in one zany dialogue exchange after another. It’s fringy and fabulous all bagged tightly for pure sensory pleasure. Which is a feat unto itself in this knawing narrative that uses a Vancouver Airport bathroom as its single point of entry. Yet it is here that two women with less than perfect pasts attempt to complete a transaction for a brighter tomorrow. Anita Majumdar’s anxiety ridden Cindy is fixed on a problem free hand-off and grows increasingly impatient with Eva Barrie’s the naïve and airheaded Crystal who is not going to have it her way on this particular day. If there were ever two down and out souls that should never be in this kind of position together it’s this awkward duo and their grunt and groan interactions. Director Vikki Anderson creates an overwhelming sense of urgency in this theatrical operation making sure both performers are entrenched in the pooh-plexingly divine dilemma in which their characters find themselves. When panic sets in that the high stakes import exercise may not transpire according to plan, the twisty production takes a surprising turn leading up to its unanticipated tragedy. Who needs a sunny day in Vancouver when drug smuggling darkness can be far more appealing. A 90-minute three-hander like Mules is not only a kilo and a half of fun, it’s small theatre’s sleeper hit of February.